A few months ago, my editor asked me to write an article on Claire Reid, a brilliant painter and tattooist who travels the world, sharing her art far and wide. Assignments like this remind me of why I love my job. Claire is a true treasure to the tattoo industry. Her innovative, beautiful style just radiates creativity. I wanted to share some of her gorgeous painting and tattoo accomplishments today, but also give a shout-out to an event she is organizing in Melbourne, Australia that will be taking place January 28, 29, 30. 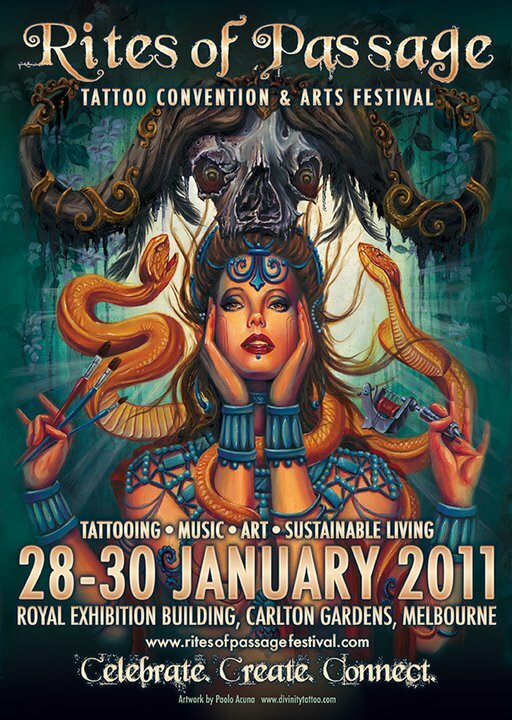 Talk about ringing in the 2011 new year...the Rites of Passage Tattoo Convention and Arts Festival will certainly be an event to remember! 100% of the profits from the Rites of Passage festival will be going to protecting Australian old-growth forests and aboriginal trusts. It will include an amazing lineup of artists and musicians and will be 100% eco-friendly. Should you reside in or happen to be traveling to the Land Down Under, be sure to read all about the event here and show your support. I also highly recommend visiting Claire's website and perusing her gallery. She is such a gem among artists. Her painterly style and imaginative designs are a breathe of imagination and color. Be sure to keep an eye out for the Tattooist Art magazine piece on Reid as well, which will be out in one of our premiere print editions.